CARPE DIEM: Oil Prices Are Falling, Do Speculators Get Credit? 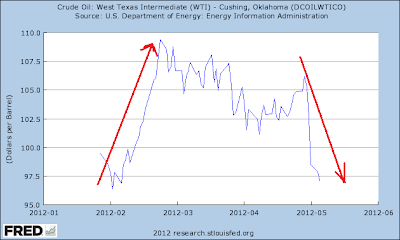 Oil Prices Are Falling, Do Speculators Get Credit? July 2012 crude oil futures prices. The top chart above displays the daily CME July futures contract prices for light crude oil back to late January, and shows the price increase in February from $98 to $111 per barrel, and the subsequent decrease to below $97 in recent trading, including the 9% decrease just during the month of May, from $106.50 to $96.50 per barrel. The bottom chart displays the spot price of crude oil over the same period, which follows the exact same pattern as prices for crude oil futures contracts. Question: Since oil speculators got the blame for rising prices in February, do they now get the credit for falling oil prices in May? How exactly does the "speculators cause high oil prices"crowd now explain the falling oil prices? Do speculators somehow contribute to only rising prices, but not to falling prices? Do speculators only trade when prices are rising, but somehow exit the market suddenly when prices are falling? To be fair to speculators, it seems like the popular press should be giving them credit now for the falling oil and gas prices. What makes anyone think these same clowns are going to have an epiphany now? It's a well known phakt among retired dentists, auto mechanics, politicians and journalists that speculators only push up prices in commodities and only push down prices in equities. Why is beside the point. And if you refuse to accept this phakt as fact, then you're an evil speculator yourself who probably runs a HFT algo from his basement and you might even be a Jew. Speculators cannot influence oil prices. But if the Fed follows an expansionist policy (even in a deep recession) then speculators will send the price of oil through the roof. 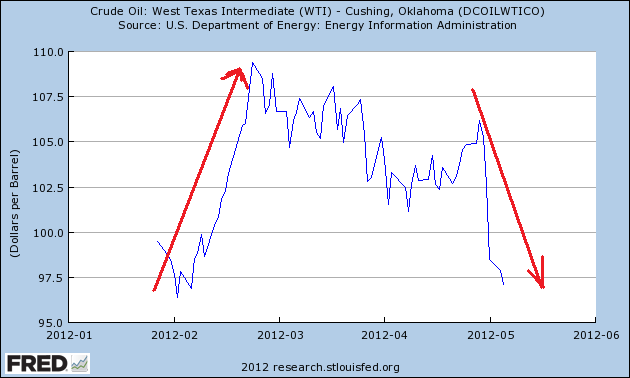 Crude oil speculators have been greedy and heartless over the last three years. Natural gas speculators have been loving and compassionate over the same period. The problem is the price that speculators create has nothing to do with supply and demand. US oil production has increased and production has decreased. Not a true market price as when the oil industry first started in this country. And speculators do not create wealth, they just distribute wealth to themselves while everyone else does the physical work of transporting and selling the product. And there would not be the high highs and the low lows without speculators...but of course that's how they distribute the wealth to themselves. All along I pretty much knew that some people do not like the redistribution of wealth unless it goes to them. I meant to say US oil production has increased and consumption has decreased....sorry. give speculators credit for what? Let's ASSUME that speculators TRIED to effect price hikes and they succeeded for a short while and then it came apart on them and they lost their shirts. what would we give "credit" for? They tried to make a killing by speculating and it worked for a short while and some got out and some lost their shirts. They need "credit" for that? I am NOT claiming that's WHAT DID happen. I'm asking a hypothetical that if they did cause the price rise but they could not sustain it, why would we thank them? Wouldn't a chart similar to the one above that also includes price verses supply/demand be able to confirm the basic thesis that it is supply and demand that affects price? why is that chart or one that purports to represent that relationship not shown? the obvious unanswered question is why did the price come down? What has cause the price drop? Is there a way to show in a graph or with numbers why prices are changing beyond the vague and unsatisfying assertion that it's the "laws of supply and demand"? It seems like we have a fricken chart for everything else here - why not one that clearly shows the relationship between price, supply and demand for fuel? We have such charts for things like fuel and electricity when there are crop failures or several coal plants go offline simultaneously. When food prices go up - we sometimes hear that it's because of a crop failure ... a freeze took out the orange crop in Florida or bad weather killed the coffee crop. that makes sense to most people. what happens to gasoline prices does not. there does not seem to be a rhyme or reason to it especially when demand is seemingly down - at least here. how about a chart that shows worldwide demand vs price or similar? Again, I'm NOT saying that is is clearly speculation going on and if someone here wants to use that as a pretext to shout insults - be advised that I'm NOT making that claim. What I AM SAYING IS THAT the reasons given for the price fluctuations don't have the same level of logic that say... a crop failure explanation would for higher food prices. Without a clear and plausible explanation, people start to assume other reasons - like speculation. ...there would not be the high highs and the low lows without speculators. beeekuzzz the price chart is the supply and demand chart. Supply and demand are balanced at any given time and what balances them is price. Where are all these "speculators"? Do they have a secret hideout? Maybe a special tattoo? Maybe you should check under your bed. All the people in the world that buy and sell anything are speculators. Every price is a speculation price. The futures market is no different than the stock market, or the bond market, or the super market. Whether prices go up or down, it is just the market process searching for a balance between ever changing supply and demand. Maybe we should stop acting like children looking for the bogeyman. "...there would not be the high highs and the low lows without speculators." Reverse that, and you'd be right. Speculators reduce volatility, they don't increase it. How? Glad you asked! If one believes future prices will be higher than current prices, one will purchase the asset. Enough people doing this can (not will, can) raise the price right now. Certainly it will not lower the price! And, of course, vice versa. Then, when the future arrives, the speculators cancel their contracts (they don't actually want to take delivery) and this pressure can (not will, can) reduce the price at that time. But that's fine - it makes for a 'lower' high... or a 'higher' low. so....what actually changed that caused the price to drop so quickly? people intuitively understand that when Florida has a frost, that oranges will be bidded up in price and speculation will happen. but they don't have that same intuitive understanding of oil and gasoline. it does not help either when they are hearing political messages that increased domestic drilling will seriously lower domestic prices. It just further muddies the issue. I bet if you produced a chart that showed US gasoline prices vs US domestic oil consumption - it would not make sense to most folks. how COULD you MAKE it make more sense? More sellers than buyers at a given price. It's not mysterious. Coincidentally (or not), in Q1 of 2012, global supply (90.6 million barrels per day) exceeded global demand (89.4 million barrels per day). For each of the previous 8 quarters, global demand exceeded global supply. And, we all know what happens when demand exceeds supply, right? "Where are all these "speculators"? Do they have a secret hideout? Maybe a special tattoo? Maybe you should check under your bed. Maybe we should stop acting like children looking for the bogeyman." This needed to be said twice. This man speak the truth, no further discussion is even needed.
" The Organization of Petroleum Exporting Countries said that global oil supplies are outpacing demand levels, keeping its forecast for world consumption this year unchanged. OPEC, scheduled to meet next month, is producing 8.3 percent more crude than it considers necessary this quarter, data released today by the Vienna-based group show. This has helped inventories in developed nations to reach “comfortable levels,” equivalent to about 59 days worth of consumption, according to an e-mailed report. “Higher OPEC crude oil production underscores the current trend of plentiful supply in excess of market requirements,” OPEC’s secretariat said in its Monthly Oil Market Report." so OPEC..._could_ inject more into the supply if they wished...but in their opinion - there is no need to do that. does anyone think their decision affects price?